In molecular biology, TBE and TAE buffers are used for agarose and polyacrylamide gel electrophoresis.TBE buffer is suitable when analysing DNA fragments from PCR amplification, DNA isolation protocols, or DNA cloning experiments. It is adapted for separating smaller DNA fragments (less than 1500 bp on a 0.8% agarose gel). analysis and in denaturing gels (instead of MOPS buffer) using prior denaturation of the RNA samples in hot formamide. 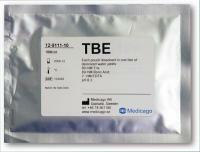 Medicago’s TBE and TAE buffers are supplied as a pre-weighed powder mix in sealed pouches giving 1000 ml of 1x, 5x or 10x Tris-borate-EDTA buffer or 50x Tris-acetate-EDTA buffer with pH 8.3 at 25°C. Empty one pouch of the TAE or TBE buffer in a laboratory flask or beaker placed on a magnetic stirrer. Add 300 ml of deionized water and stir the solution for a few minutes. Adjust the volume up to 1000 ml, stir until full dissolution and the buffer solution is ready to use. TBE and TAE buffers are shipped at room temperature. Store the pouches in a dry place at room temperature. Shelf life is three years after production date.